The Select Geolocation File pop-up is used to import the image geolocation (coordinates and orientation) from a file. For more information about the content and the format of these files: Input files. Browse: Selects the geolocation file. Select this option to import a geolocation file with WGS84 (latitude, longitude, altitude) coordinates in Pix4D's file format. For more information about the format of the geolocation file: Input files. Select this option to import a geolocation file with WGS84 (longitude, latitude, altitude) coordinates in Pix4D's file format. For more information about the format of the geolocation file: Input files. Select this option to import a geolocation file with (X,Y,Z) coordinates in Pix4D's file format. For more information about the format of the geolocation file: Input files. Select this option to import a geolocation file with (Y,X,Z) coordinates in Pix4D's file format. For more information about the format of the geolocation file: Input files. Select this option to import a log file delivered by 3D robotics UAVs. For more information about the format of the log file: Input files. 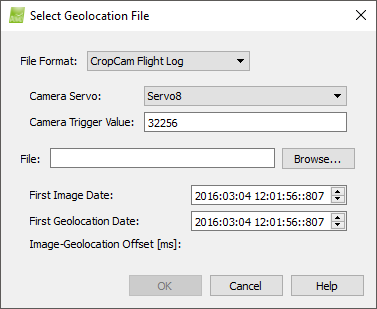 Select this option to import a log file delivered by CropCam UAVs. For more information about the format of the log file: Input files. The Camera Servo section defines the servo on which the camera is mounted. By default the camera servo is Servo8. If the camera is mounted on another servo, click on the drop down list and select the appropriate servo. The Camera Trigger Value corresponds to the value that the camera servo takes when an image is triggered. The default value is 32256. To change the value, click on the text box and enter the new value. First Image Date: Corresponds to the date and time the first image is taken. First Geolocation Date: Corresponds to the date and time of the first geotag. Image-Geolocation Offset [ms]: It is computed automatically once a File is selected. It uses the above two values, in order to correctly match a geotag with each image. Select this option to import a log file delivered by QuestUAV UAVs. For more information about the format of the log file: Input files. Select this option to import a log file delivered by Tetracam's software PixelWrench2. For more information about the format of the log file: Input files.